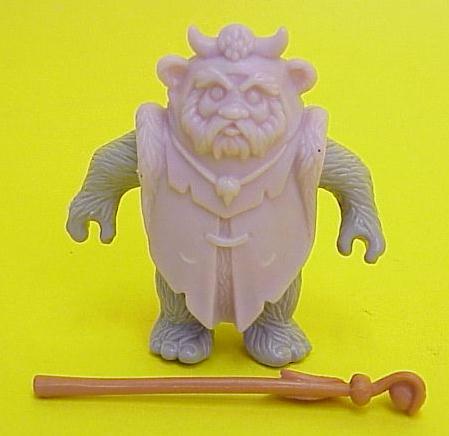 Kenner planned to release six new characters for the vintage Ewoks cartoon series. Sadly the Star Wars toy craze had diminished by that point and the line was cancelled, despite the figures' presence in the 1986 Kenner Toy Fair Catalog. Although unreleased, the 2nd series Ewoks figures were extremely close to production as evidenced by existing production quality examples nestled safely in the hands of private collectors. 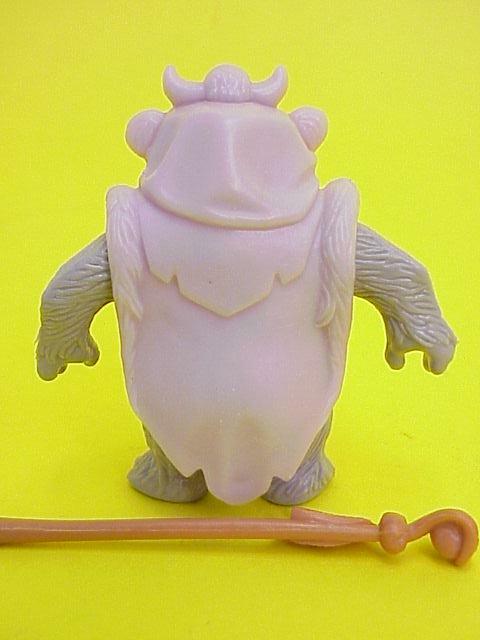 The unpainted Chief Chirpa figure shown above clearly illustrates that production quality steel molds were generated in preparation for the production run. Unlike a fully finished figure, this example exhibits non-production color plastic, lacks any paint applications, and is not sonic welded. A prototype of this nature is typically referred to as a first shot, since it is produced during injection mold testing. The second image affords a glimpse of the figure from the back side. Simliar to a production quality figure, this example exhibits copyright information signifying it was a later mold test. The copyright information is etched directly into the steel molds after preliminary mold tests are completed and approved. The presence of an accessory with the first shot is a nice feature, since many UDE collectors place as much importance on accessory presence as they do the actual figure. Sadly, Chief Chirpa's satchel is absent from this example.